I hardly grew up eating mushrooms. Mushroom were not easily available in the market those days. Since the stories of the intake of poisonous mushrooms and hospitalization were so common, my mom never bothered to get it. So I never got a chance to try it at home. I believe it was during my hostel days, I had my first mushroom dish. My life in US definitely changed my notion of mushrooms. The availability of different varieties of fresh mushrooms and the versatile ways you could use them in cuisines changed me 360 degrees. Soon I started experimenting with mushroom and eventually it became an inevitable item in my pantry. It is hard to change your taste buds quickly until and unless you keep trying persistently. It gets tricky when you want to serve some veggies for your kids which is in their 'Bad Vegetable' list. I am still not successful in serving a mushroom only dish to my kids. They hate the earthy taste of it. Only way to feed them some mushrooms is by sneaking in their omelets, soups and pasta sauce. Hope they will develop the taste for mushrooms one day like me. That being said, this is completely an adult dish. 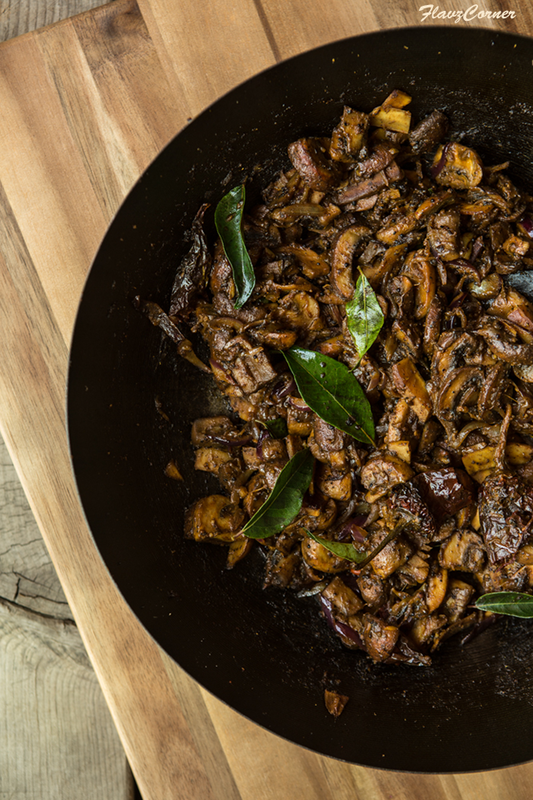 This spicy pepper mushroom is cooked in a South Indian style. The use of shallots, coconut pieces, curry leaves and coconut oil definitely imparts the authentic Kerala flavor to this pepper mushroom. This is a good vegetarian substitute for those who don't eat meat. Hope you will try this dish soon and let me know how it turns out for you. Heat a cast iron wok with 2 tsp of coconut oil. Splutter the mustard seeds in it. Add the sliced shallots, crushed garlic and ginger and saute for few minutes till the raw smell goes away. Add the dry chilies. Add turmeric powder, garam masala, pepper powder, chili powder followed by mushroom, coconut slices, curry leaves and salt. Cook till all the water is absorbed. Once it is dry, make a well in the center of the wok by pushing the mushroom to the sides, add 1 tsp of oil, add the sliced shallots, garam masala, and pepper powder. 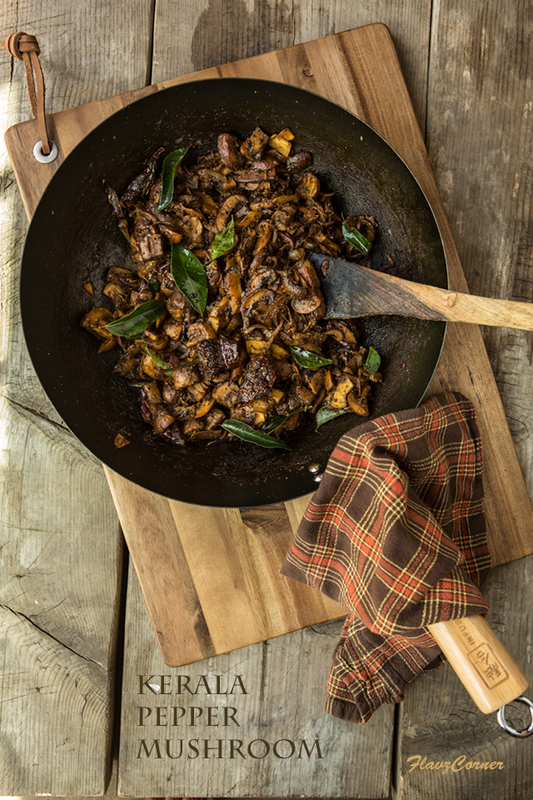 Let it cook for a minute; mix it with the mushroom and finally garnish with curry leaves. Enjoy the Kerala Pepper Mushroom with plain rice and spiced buttermilk. I almost never had mushrooms when I was a kid -- just weren't available. You could buy canned ones, but why would you want to? :-) Anyway, this looks great -- thanks. 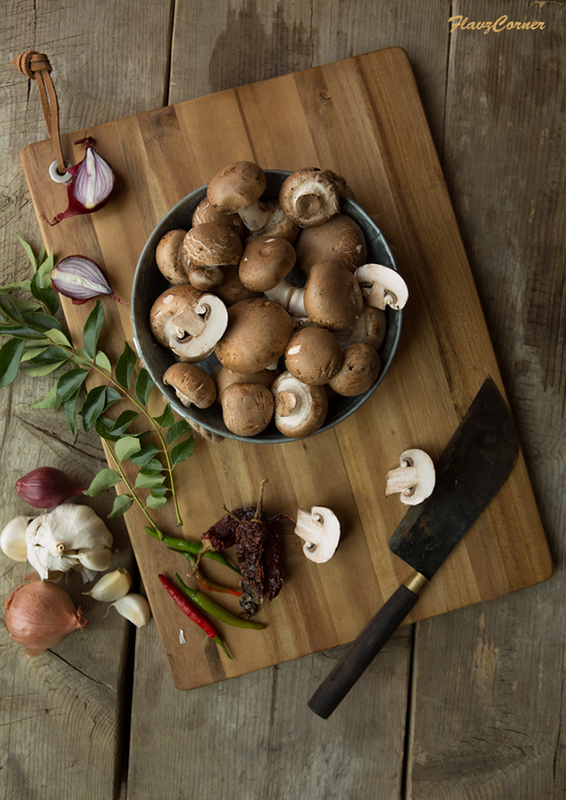 We love mushrooms and this peppery one will go down well with my family.